This is more than a little annoying. 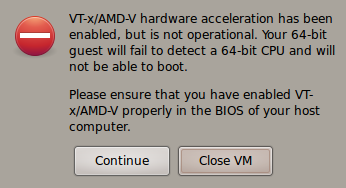 After upgrading my VirtualBox to version 3.1.6, it now decides that my cpu’s AMD-V is not operational. Everything was fine previously, everyone played nice together. Now it refuses to start my 64bit guests. After spending some times googling for a solution or a workaround, I think I have found an acceptable workaround. From what I have read, previous versions of VirtualBox ignored the VT-x/AMD-V setting on my motherboard. I had two servers which were affected. The workaround that I have found involves setting the following environment variable. So I appended the following to my /etc/profile. I logged out and logged in again and now things appear to be fixed. I am able to start and run my 64bit guests again. This entry was posted in linux and tagged linux, ubuntu, virtualization by Neil Smith. Bookmark the permalink. Btw.. can you tell me which module to look in the BIOS to see if AMD-V is enabled? I checked enabled in “Secure Virtual machine” section under CPU configuration in BIOS.. it would clear any more doubts if you could tell me..
You have selected the right thing. For AMD cpus it is called SVM or “Secure Virtual Machine”. I wish I had a permanent resolution. Until then, I’m using this work around. If I learn more I’ll certainly post an update. BTW, do you have kvm kernel modules loaded? I am currently pursuing that angle for a root cause.